In our spacious classrooms and facilities where outdoor play is encouraged, we foster the growth of children from varying age groups. We conduct our programs in French and we make the learning process exciting, fun and engaging for our students. 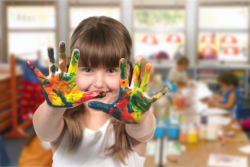 To enroll your child at Les Petites Perles Child Care Centre, please call 905-337-9000.